This is just a quick post to update what happened the day after solar charging the truck's battery. 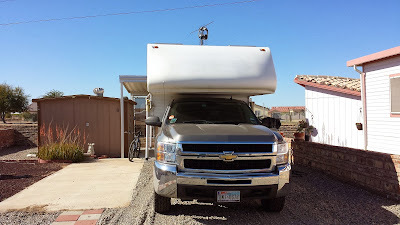 As you'll recall the battery had gone completely dead during my boondock on the BLM's remote Coyote Ridge Long Term Visitor Area (LTVA) near the Imperial Dam. About 9 am the next morning I climbed into the truck's cab turned the key in the ignition and it started right up with plenty of cranking power! I guess the lesson about truck batteries with fill caps is....keep them filled! I know I'll regularly check fluid levels in it from now on. The Tank parked back at the KOFA Ko-op. So I drove back to Yuma went shopping at Walmart, came back out and the truck started again so I drove over to the KOFA Ko-op to spend 3 days getting ready for another 14 day boondock up north around Quartzsite, AZ where a giant RV show begins January 18th through the 26th.